Perusing a map of Edinburgh a few years ago I realised that Edinburgh is built on seven hills. The famous three in the centre: Castle Rock, Calton Hill, Arthur's Seat; then four more round the outskirts: Corstorphine Hill, Braid Hills, Blackford Hill, and the Craiglockhart Hills (of which there are two... so maybe there are eight hills of Edinburgh). Idly I drew a route between them all - and was excited to see that it was roughly a half-marathon in distance. I wanted to run it! Then I discovered the Seven Hills of Edinburgh race, which has been going since 1980. But I had no interest in the race. Like the now defunct Caledonian Challenge (a race along the West Highland Way for corporate teams) and TGO Challenge (a self-guided route between the west and east coasts of Highland Scotland), doing the route on a set day within set parameters seemed a bit too organised and restrictive. I just wanted to discover the route in my own pace and time. 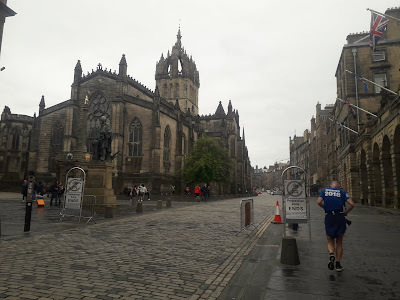 The official race starts and ends on Calton Hill, but we were doing the route we wanted, so started and ended at my friend's house in Newington on an overcast, humid morning. 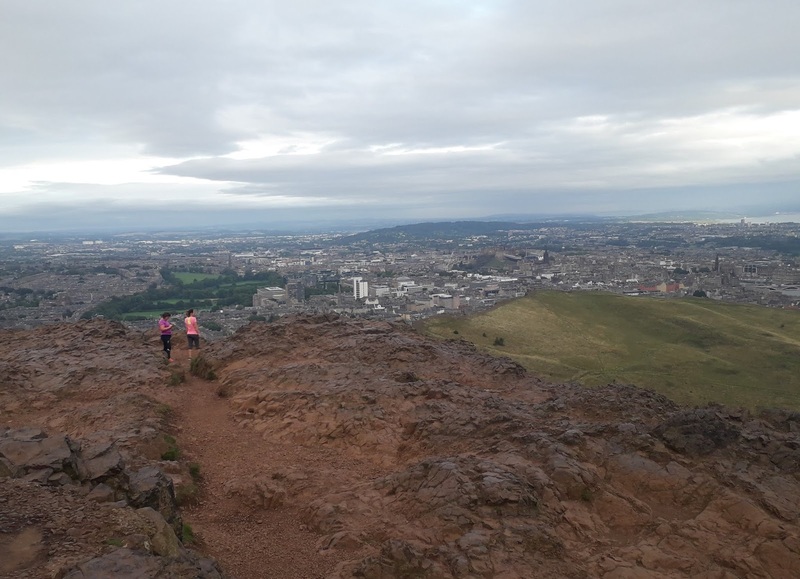 The obvious first hill is Arthur's Seat: get that done while the legs are fresh. From the top all the hills can be seen. Corstorphine a fair distance, Calton Hill just a leap away across the valley of Holyrood Park, the unknown territory of Craiglockhart and Braid overshadowed by the distant Pentlands. A slippery descent from Arthur's Seat on loose gravel, ravens and adventurous tourists at the summit, then Regent Road and Calton Hill which was thronged with Chinese tourists taking photos of Princes St. 8.30 in the morning and this was the busiest part of the whole route: up North Bridge and on to Castle Hill, moving well, the Castle Esplanade blocked by tattoo works so down to Johnston Terrace, round the base of Castle Rock and the fountain on Princes St Gardens. We talked of families and holidays as we took the easy drag up Ravelston Dykes; steepening for Corstorphine Hill then a moment of confusion. Where is the top? Corstorphine Hill is a level, tree-lined ridge so we couldn't tell. I had intended to take to a road down the west side of Corstorphine Hill in descent, but signs indicating the John Muir Way were too tempting so we followed them, getting lost in brambly undergrowth then arguing over the best way forward. "My auntie lives in Slateford, I know the way," said my friend, who turned out to be right. By now the weekend traffic was in full flow, and climbing towards Craiglockhart Hill on busy streets was the least enjoyable part of the route: but it did not take long to reach Napier University, and a farcical detour into the campus which saw us clambering over a wall and through more undergrowth to reach a path on Craiglockhart Hill West. This is the higher of the two Craiglockhart Hills. 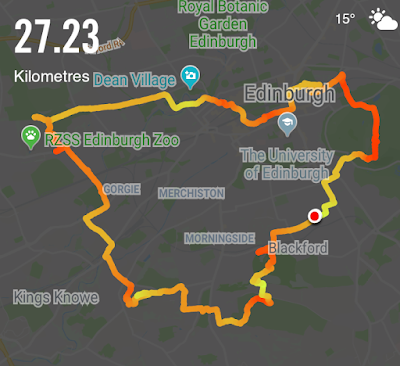 I don't know why the official route doesn't go over it (chosing Craiglockhart East instead), but as we debouched onto a golf course with games in full swing it became apparent we may have made our approach from the wrong direction. A dash across the golf course and we were accosted by two dog-walking ladies, one of whom ordered us "stick to the paths, this is a site of special scientific interest." The perils of urban orienteering. 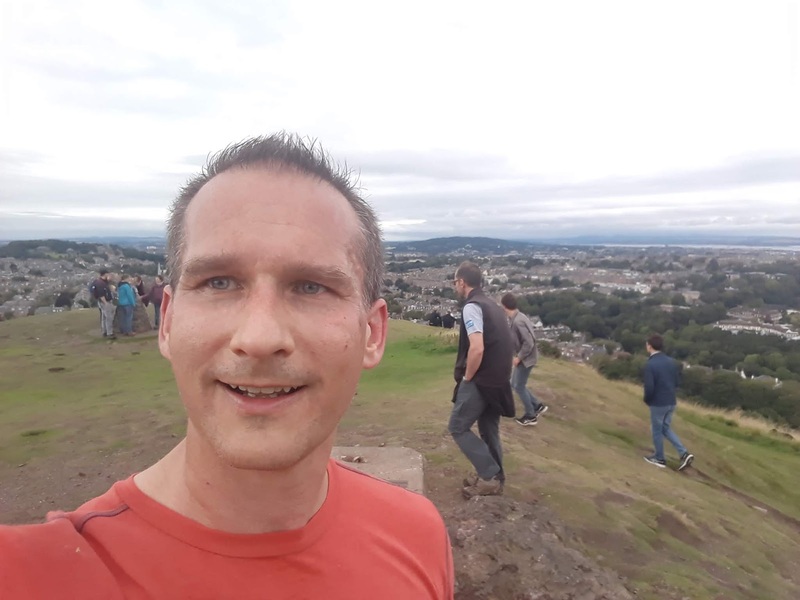 After Craiglockhart the Braid Hills looked high but went easy enough after dropping to walking pace before the summit, navigation fortunately on point despite this being my first ever visit. Just one more hill to go and another golf course to negotiate. Bramble pickers out in force - the brambles have ripened early this year - and happiness in simple movement across the landscape. But oh! I think I went the long way round to get up Blackford Hill. But no mind... I had a cunning plan to head straight down... but came a cropper as I ended up nearly back where I started up Blackford Hill on Midmar Drive. This route definitely repays local knowledge! My friend had had to bale out after Craiglockhart to get home in time for child-minding duties, and I popped round to say hello and relay the official stats. 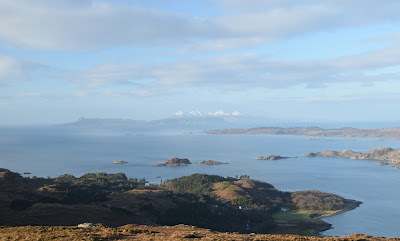 According the seven hills website the shortest route is 14.3 miles with 2,200ft of ascent. Aaccording to my tracker we did 17 miles (2.7 miles further than the shortest possible route!) 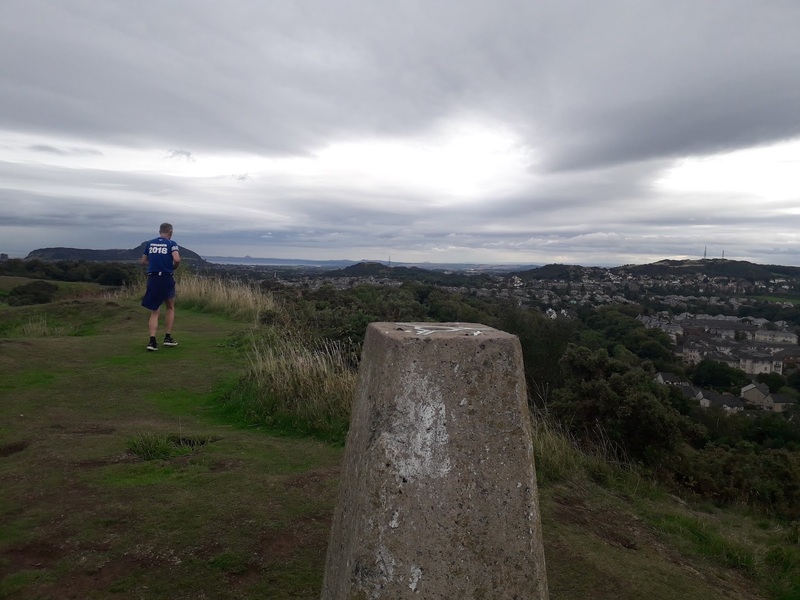 in 3 hours and 8 minutes of running time, plus another 21 minutes of hanging around on the tops taking selfies, buying lucozade from shops, arguing over which way to go next, etc. I am going to do this route again. It was an absolute blast.